Pisa International Airport "Galileo Galilei" and Florence International Airport "Amerigo Vespucci". From the airport either rent a car, or take a taxi (for a cost of approximately 50 € from Pisa, and 100 € from Florence) or a bus. From Pisa Airport, take an interurban bus of the "Autolinee Lazzi" leaving from the airport. The journey will take approximately one hour. You can check the schedule visiting the page: Pisa airport - Lucca by bus. From Florence Airport, take an interurban bus of the "Autolinee Lazzi", direction Florence/Montecatini/Lucca; there is a dedicated bus stop immediately next to the airport. The journey will take approximately one hour and forty-five minutes. You can visualize the schedule of the connections on the following website: www.lazzi.it. Lucca Train Station is directly connected to the main Tuscan provinces and tourist locations such as: Pisa, Viareggio, Montecatini, Pistoia, Florence, Aulla. You can check connections and timetables at the website of the Italian State Railways website. 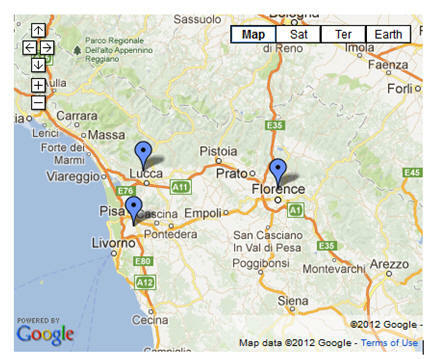 Lucca is easily reachable by motorway from Florence (1 hour driving), Rome (4h), Milano (3h).